Your high school athlete needs to eat a balanced, healthy lunch to keep his energy levels high during after-school sports and other athletic activities. Along with providing energy, a healthy lunch can also keep your teen's body and muscles growing properly. Because busy teens typically have little time at lunch, it's essential to pack quick, healthy options that are loaded with both nutrition and flavor. Your high school athlete should include protein-rich foods in her lunch every day. Protein helps build and maintain muscle muss, which is essential for athletic endurance and performance. Most high school athletes need 1 to 1.5 grams of protein per kilogram of body weight, which translates to around 75-100 grams of protein per day, according to dietitian Sharon Howard in an article for ESPN. Aim for around 25 grams of protein at lunchtime. High-protein lunch ideas include a whole-grain hoagie with lean turkey, a serving of black beans with diced chicken or a peanut butter sandwich on whole grain bread. Pack lunches that are high in carbohydrates, which are found in grains, fruits, vegetables and dairy. When carbs are digested, they break down into glucose, which provides your teen's body with immediate energy. Any unused energy is stored as glycogen in the liver and muscles for later use, such as sports after school. Your athlete should eat at least six to eleven servings of grains per day, so include several with lunch. Stuff a whole-wheat pita with lean turkey and low-fat cheese like Swiss cheese. Or pack a bowl of brown rice or whole-wheat pasta topped with your child's favorite sauce and veggies. Fruit and vegetables are loaded with vitamins and minerals that help fuel your child's physical activity. For instance, cauliflower is high in B vitamins, which convert blood sugar into energy. Iron-rich foods like dried apricots and prunes also help provide energy. Fruits and vegetables are also high in water, which can help keep your athlete hydrated. 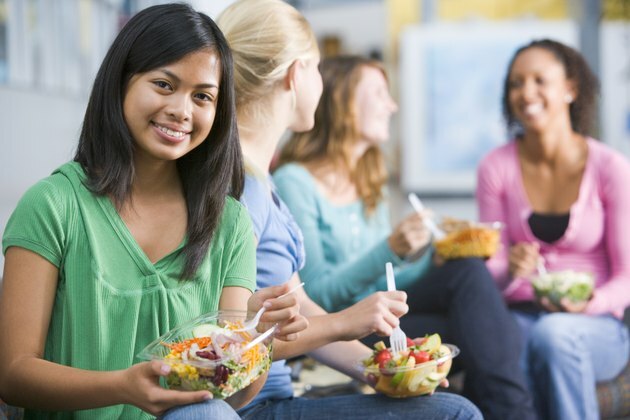 To keep in peak physical condition, your teen should have at least one fruit and vegetable at lunchtime. For example, include a piece of whole fruit or a baggie of raw vegetables. Or pack a pizza topped with mushrooms, green peppers, pineapple and artichokes. Or make a tuna salad loaded with grapes, cucumbers and onions. Dairy products are not only high in carbohydrates and protein, they are rich in calcium, which can help your athlete build stronger bones. For best results, your child should have at least one serving of dairy at lunchtime. For example, pack a small carton of milk or a low-fat yogurt sprinkled with granola and your teen's favorite fruit. Or your athlete can eat an English muffin topped with low-fat cheese and pizza sauce. How Much Protein Does My Teenage Boy Need?